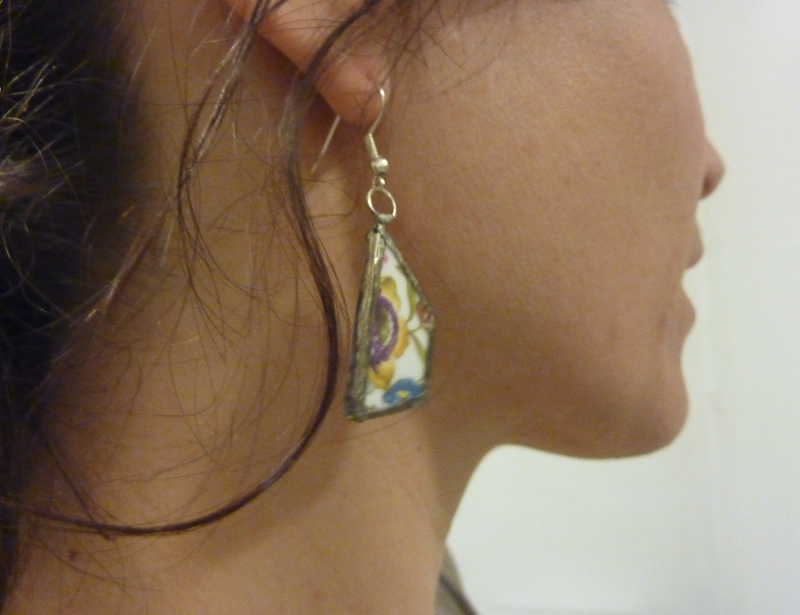 Jovial Spondoodles: Smashed plate Earrings! 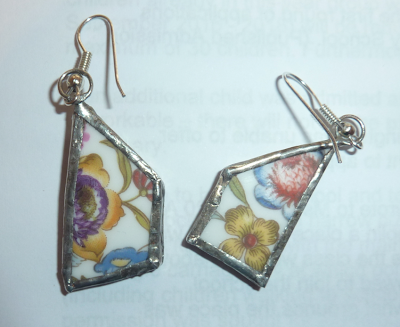 Jewellery from broken china tutorial. 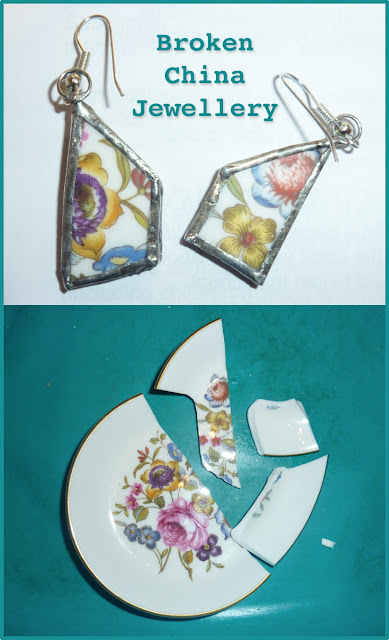 Smashed plate Earrings! 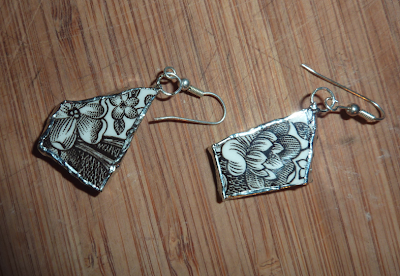 Jewellery from broken china tutorial. 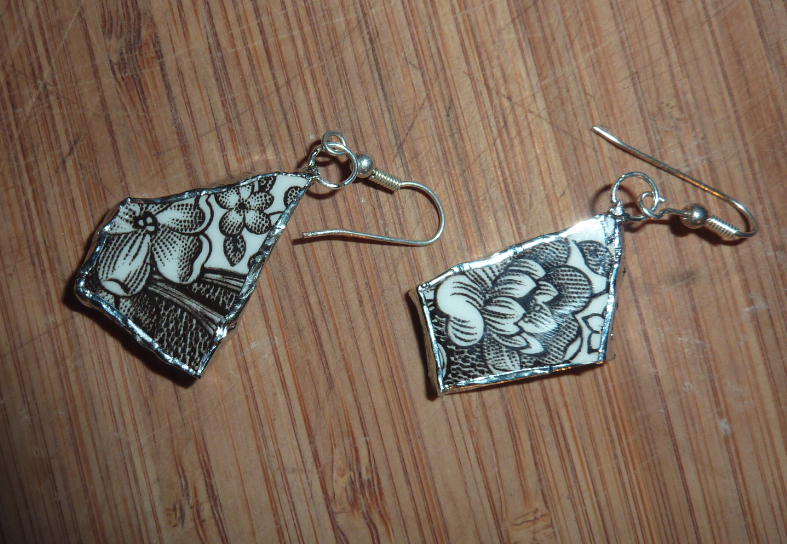 My new hobby is making earrings from smashed plates! It's been great fun searching the bootsales for suitable china and also digging out my old soldering iron I received as a free gift from my subscription to Real Robots magazine a few (ahem) years back! An ideal plate should have the main pattern on the flat part of the plate, not the rim, and also too be as flat as possible on both sides. It is a bonus if there is a reverse makers mark or such like on the reverse. 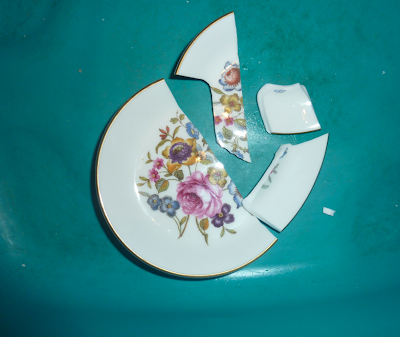 It's a lovely bit of recycling if the plate is already smashed but I have to admit I did this one on purpose! Start by cutting the pieces to size and shape. A wheeled tile cutter is ideal for this. Then sand the pieces to remove the rough edges. I used quite a rough grit sandpaper for this. 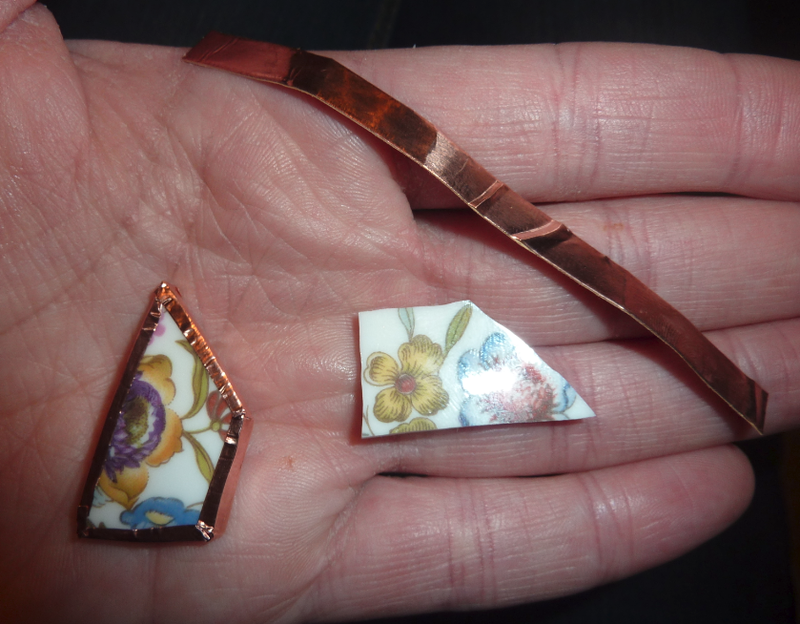 Then wrap the pieces in copper foil tape. This is self adhesive. Try to get it as smooth as you can as this will make a difference when the solder goes on. 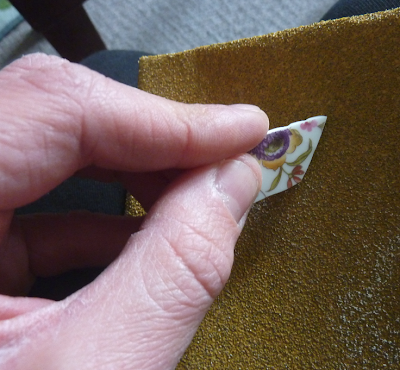 When it is on then rub your fingernail along all the edges and sides to make sure it is securely adhered. Now the fun part! 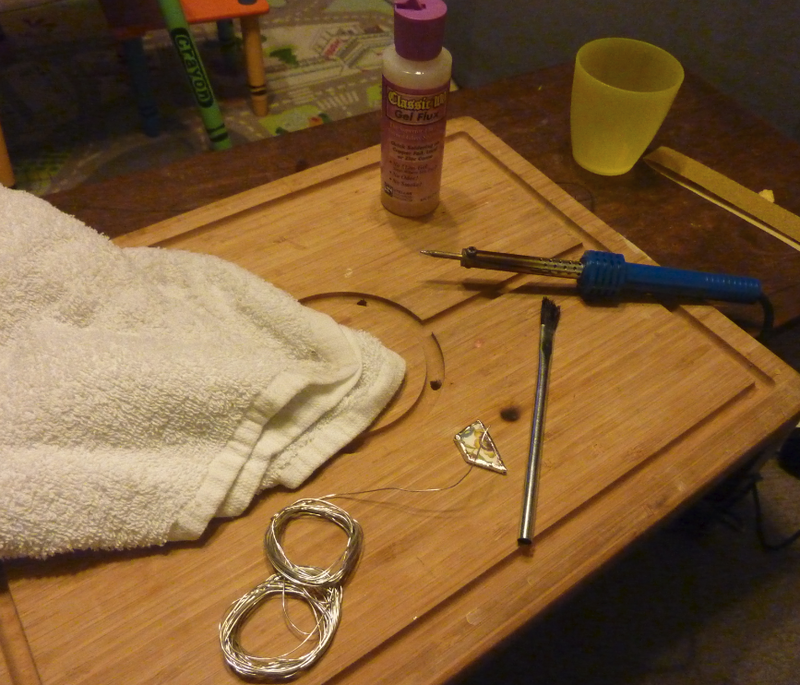 Heat up your soldering iron and then brush some flux onto the copper. Melt a blob of solder (lead free as this will be going near skin as jewellery) onto the iron and then run it along an edge. I like to do the edge first and then the front and back but it is up to you. 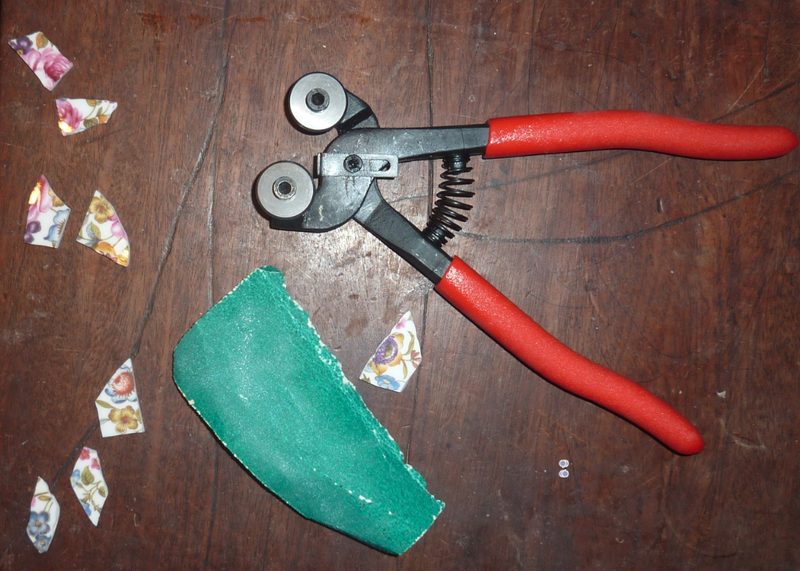 A pair of tweezers or long nosed pliers would be ideal here to hold your piece as it does get quite hot. A damp cloth is also handy to wipe the soldering iron every so often. Be careful and make sure the cloth is thick and damp as the iron is very hot!!! When you have finished and are happy with your solder then add a jump ring with a blob of solder to which you will attach your earring hook (or chain etc). 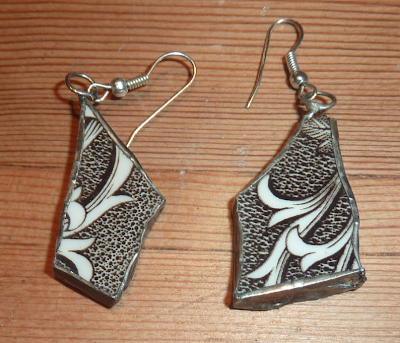 I like a more 'tarnished' than bright silver finish so I also rubbed on a black patina with some cotton wool. 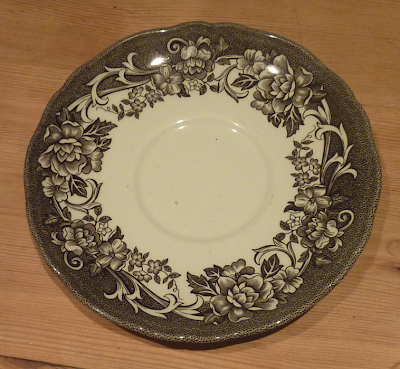 This soon dulls the shine and gives a more worn-in feel which I feel suits the old china. Give it a good clean after this as it is best not to get on the skin. 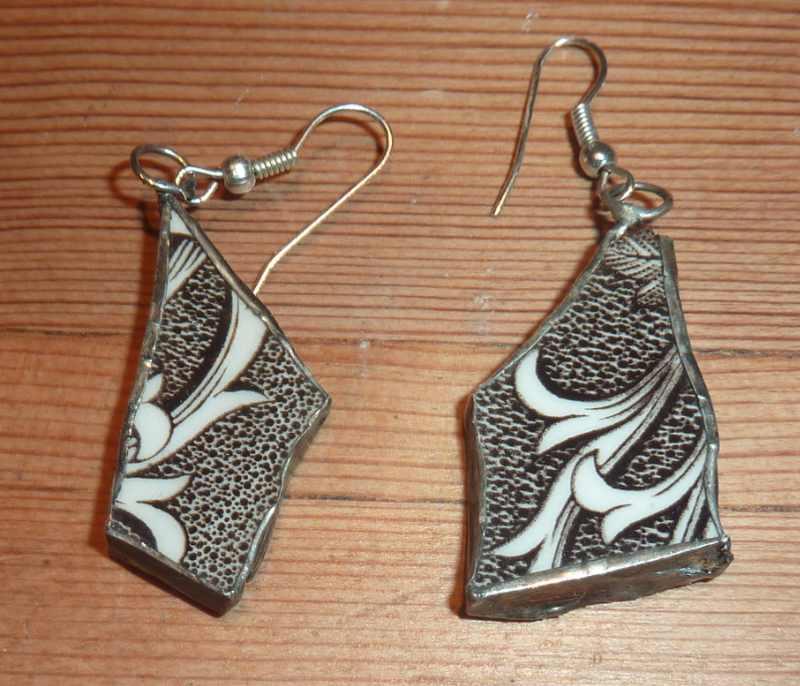 Attach your earring hooks and you are ready to wear them for an evening out! I also made these 2 out of this saucer! Plates / china preferably already broken! You do make it look easy! Thanks for sharing the technique! Sounds lovely! Let me know a link to see it if you post a photo anywhere! Thanks for this tutorial! I picked up a bunch of broken chine from my great great grandparent's homestead and have just been waiting to try something with them! More seaside exploits and an eventful day!